With just a short walk to St. Lawrence Market, Distillery Historic District, Financial District, Subway and Lake, this Downtown East site has it All. Situated on one of Toronto’s oldest Streets and close to where the original Parliament Buildings and capital of Upper Canada were once located. With the charming architecture of the original Christie, Brown & Co. Stables (which serviced the famed Christie Cookie factory) as an intact anchor at the base of the new building, modern metal, brick and glass will build on this architecture. This fusion is the formula for the dynamic P-Funk inspired architecture. Change and rejuvenation are the hallmarks of this dramatic 21-storey building, with 10 mid-rise floors topped by 11 high-rise floors enriching Toronto’s skyline in the Downtown East. This is the place. Downtown East is enjoying a complete rebirth and rejuvenation. Areas of interest and amazing spots are always popping up. Major infrastructure investments by government and business alike are making the Downtown East ‘the’ place to work, play and now, live. The upscale King Design District is just down the road. The iconic, historic and freshly stocked & Ryerson University are just a few of the educational institutions you’ll find nearby. And the destination that has become the Distillery District is a walk away, too. The area is filled with big box necessity providers and even more cool independent shops, purveyors and hidden gems. Then there’s Yonge Street’s Eaton Centre & TTC Subway just a few steps away. Living here means, getting around the city in minutes. In the East United lobby your entrance will be grand with accents of glass, stone and sparkle. Also there’s the peace of mind of a 24/7 concierge and state of the art security access for all residents. Make a plan to meet up here, call for a cab or simply plan an adventure that’s a walk away and just outside your door. Here, you’ll be surrounded by design, elegance and the energy of a great city. At East United Condos, residents will be greeted by a stunning podium, along with a breathtaking entrance fronting onto historic Parliament Street. Step inside or go for a quiet stroll along the fully landscaped pedestrian mews which runs right through to Berkeley Street. In the lobby your entrance will be grand with accents of glass, stone and sparkle. Also there’s the peace of mind of a 24/7 concierge and state of the art security access for all residents. Make a plan to meet up here, call for a cab or simply plan an adventure that’s a walk away and just outside your door. Here, you’ll be surrounded by design, elegance and the energy of a great city. There are 194 vehicle parking spaces proposed in the 3 level of underground parking with access on Parliament Street of which 163 are for residents and 31 are for visitors. There are 298 bicycle parking spaces of which 249 are for residents, 34 are for visitors, 5 are for retail and 10 are for office. There will be one loading dock. 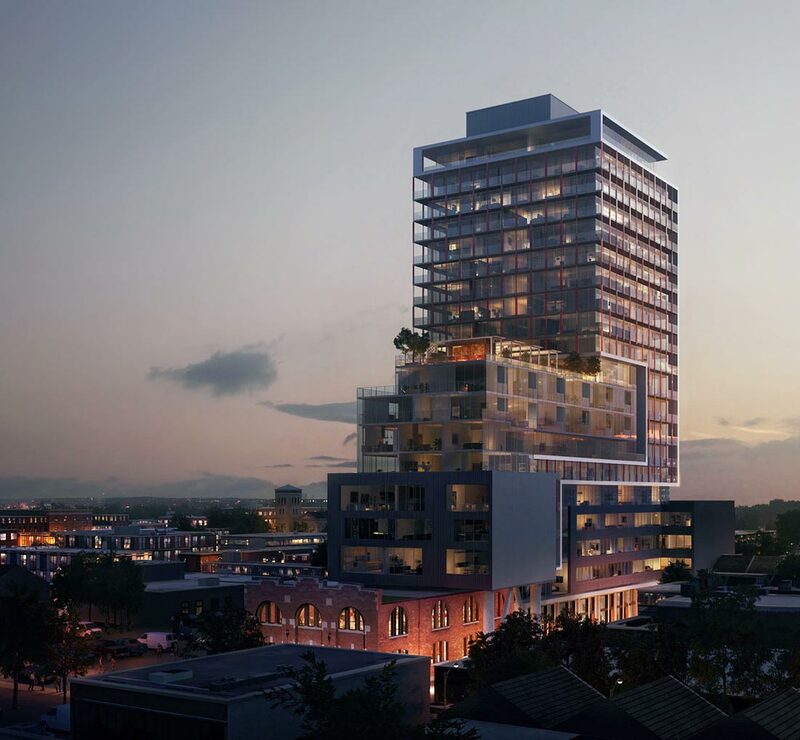 This development “site is a “L” shaped parcel located within the block bordered by Parliament Street to the east, Adelaide Street East to the south, Berkeley Street to the west, and Richmond Street to the north.” Access to retail space and to the residential lobby is proposed from Parliament Street and access to office space is from Berkeley Street. There is 596 square metres of indoor amenity space proposed on the ground level, 2nd floor and 10th floor and 350 square metres of outdoor amenity space proposed also on the 10th floor. Amenities would include a 24 hour concierge. Live, play, work, learn, where you can actually live. Walk to the St. Lawrence Market, Corktown, Distillery, Financial District, subway or lake. Stay in and hang in the workshop, music lounge or meditation area. It’s all united at this sleek, historic, electric condo in Old Toronto Neighbourhood. Downtown East now has it all.